Damn: this blogging game ain’t easy. Depletedsoul mentioned that he was struggling to find things to post that weren’t about already and I have to agree. Such is the quality of other hip hop oriented blogs that it is difficult to find original albums to post! Good lookin’ out to all you fellow bloggers out there. Still, I’m going to continue posting albums even if I’ve seen them appear elsewhere in the past; I hope that the comments left by me are motivation enough to keep people locked to From Da Bricks. It’s Sunday so I’ve picked something in keeping with an end of weekend atmosphere. 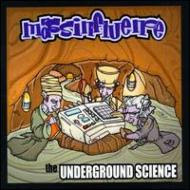 ‘The Underground Science’ is a chilled album that moves smoothly through its eleven track selection, maintaining a laid back vibe throughout. At times it almost has a live feel to it with smooth, jazzy loops and rim hits that resonate behind the MCs’ smooth delivery. Most of the content revolves around the dismissing of less proficient rappers and professing the ability of the Mass Influence crew themselves: effective, but slightly lacking in originality given that this album was released in ’99. Still, their voices work well with the beats to produce a relaxing and relatively organic sound. For those of you familiar with Ninja Tune, a leading UK hip hop/beats label, you can also check their appearances on Dynamic Syncopation’s first album which are very similar to ‘The Undergound Science’ itself (keep me bookmarked folks as this will be a future post). Sconeboy mentioned that this may have been what became of ‘Yall So Stupid’; whether this is true and if they maintained exactly the same group dynamic or not I am not sure. It would certainly mean a departure in style given the upbeat tone to ‘Van Full Of Pakistans’ (of course this album was released seven years earlier). If you know, drop a comment either here or in the CBox.